The Temple was erected at the end of the Kamakura Period (1185-1333) by Do-un Nikaido (1267-1334), a high-ranking and intelligent military commander of the Kamakura Shogunate, naming Priest Muso (1275-1351) as the founding priest. Entering the Muromachi Period (1336-1573), the Temple continued to receive patronage from the Ashikaga family, who controlled the Muromachi Shogunate. 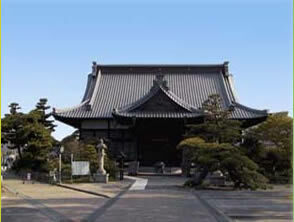 In fact, the Temple once had a sub-temple for mother of Takauji Ashikaga (1305-1358), the founder of Muromachi Shogunate. The Temple was so closely associated with the family that remains of four Kamakura Governors and other members of the Ashikaga family were buried here. Founding priest Soseki Muso was born in Ise, Mie Prefecture. As a Zen priest, he came to Kamakura in 1295 at age 20. After studying Zen further in Kyoto, he came back to Kamakura in 1299 at the invitation of Takatoki Hojo (1303-1333), the 14th Regent, and joined Kenchoji. In 1327, he was enrolled in Jochiji, while helping Nikaido to found the Temple. Engakuji nominated him to be its 15th chief priest. Obai-in sub-temple in Engakuji was built solely for him, where he educated quite a few young priests, and later they were called Muso-school priests. So influential they were that it was no exaggeration to say their dogma was the mainstream of Zen Buddhism in the Muromachi Period. In addition to Zen, Priest Muso also had an excellent talent as a garden designer. Famous gardens designed by him include those of Saihoji, a.k.a. the Moss Temple, and Tenryuji in Kyoto. Most notable among the temples he founded would probably be the world-famous Ryoanji and Rokuonji, generally known as Kinkakuji (Gold Pavilion) in Kyoto. One of Priest Muso's disciple was a priest by the name of Shusin Gido (1325-1388), who once lived in the Temple, though mostly active in Kyoto serving Yoshimitsu Ashikaga (1358-1408), the Third Ashikaga Shogun, as a Zen master. When Yoshimitsu and Ujimitsu Ashikaga (1359-1398), the Second Kamakura Governor, was on the verge of crash, the Priest Gishu stepped in as a mediator and settled the dispute amicably. In its golden days, the Temple had more than 10 sub-temples. In the late Muromachi Period, however, the Temple's fortune began to wane with no specific patrons or sponsors. Engakuji helped the Temple in the Edo Period (1603-1868) sending chief priests from time to time. Mitsukuni Tokugawa (1628-1700), one of the most powerful and well-known members of the Tokugawa family, often came to Kamakura, and donated a wooden statue of Senju (One-Thousand Armed) Kan'non, or Sahasrabhuja in Skt, which is now enshrined in the main hall. It is a typical Zen style structure called Hogyo zukuri with its roofs curved upward and rafters spread radially. On top of the roof is a peach-shaped Hoju, or mani in Skt. A similar structure is also seen at the main hall of Tokeiji. Enshrined in the center as the main object of worship is a statue of Shaka Nyorai (Sakyamuni in Sanskrit), and that of Senju Kan'non on his right. Also enshrined to the left of the Shaka statue is that of Priest Muso. All are rather small, perhaps less than 1 meter tall. 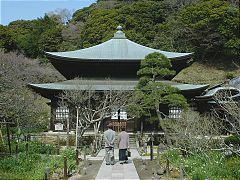 Senju Kan'non is listed as the sixth of the Kamakura Thirty-Three Kan'non Pilgrimage. A 120-centimeter-tall wooden, sedentary statue of Priest Muso, the founding priest, carved in the 14 century shortly after his death. It is highly esteemed by connoisseurs and the artistic value is said to be comparable to that of Priest Mugaku at Engakuji. A wooden statue of Motouji Ashikaga (1340-1367), the first Kamakura Governor who died young at the age of 27, and that of Ujimitsu Ashikaga (1359-98), the second Kamakura Governor. Both statues were made during the Edo Period (1603-1868). Next to the Kaisando Hall stands a small hall, in which a statue of Jizo Bosatsu, or Ksitigarbha-bodhisattva in Skt. is enshrined. It was fashioned during the latter half of the Kamakura Period (1185-1333), and installed at another Zen temple called Chiganji (no longer exists) located at Ogigayastu, northwestern part of Kamakura. When Chiganji was financially drained to the extent of dilapidation, a caretakers of the statue tried to run away. But a Jizo Bosatsu appeared in his dream one night and told him, "No matter where you may go, there would be no change." Following the divine suggestion, the caretaker stayed at the temple and continued to take care of the statue all the rest of his life. This is a story told probably in the Edo Period. Without any financial support from parishioners or other institutions, many temples had to make ends meet selling temple assets such as Buddha statues and bells, and some of them were forced to just disappear. Dokomo means everywhere implying the condition will remain unchanged no matter where you may choose to go. Near the Temple gate stands a stone monument for Sho-in Yoshida (1830-1859), one of the most influential patriot in the mid 19th century. Back at the time, Japan was under tremendous pressure from Western powers to open up the country to the world. Priest Sho-in Chiku-in (1796-1867), the 25th chief priest of the Temple, was his uncle and Yoshida visited here once in a while to see him. When Commodore Matthew C. Perry (1794-1858) of the U.S. Navy came again near the shore of the Miura Peninsula in March 1854, Yoshida slipped aboard one of the Commodore's ships in an attempt to smuggle himself to the West. The night before the attempt, he had visited the Temple and met with the uncle. His plan, however, turned out unsuccessful and he was imprisoned. Later, he was executed in Tokyo at the age of 28.